I would like to propose an idea completely counter cultural. It is a revolutionary idea that will set you apart from many of your friends and family. While it is not an original idea, it seems to have been lost by many families and for many years. Give Sunday to God. Of course, the originator of this counter cultural idea is God. Unfortunately, in contemporary society God has Himself become counter cultural. Remember the sabbath day, to keep it holy. Six days you shall labor, and do all your work; but the seventh day is a sabbath to the Lord your God; in it you shall not do any work. The sabbath was made for man, not man for the sabbath; so the Son of Man is lord even of the sabbath. What we have seen developing over recent decades in America, even among Catholics, is somewhat of a “heresy of the weekend”. In other words, the sacred and long held belief that Sunday belongs to God has instead been replaced by the post Christian concept of the weekend. An explicit commandment of God has been largely rejected and in its place leisure and commercialism have been embraced. The historic blue laws of our society that prohibited most forms of commerce for either part, if not all, of Sunday have all but disappeared from most communities. The religiosity of such laws are a direct contradiction to the radical secularism that pervades our culture. It is interesting to note, however, that the courts have repeatedly upheld the constitutionality of such laws. They have faded into history not by legal decree, but due to popular consensus. That the Catholic Church strongly endorses the spiritual necessity to keep holy the Lord’s day is seen clearly in the First Precept of the Church: You shall attend Mass on Sundays and on holy days of obligation and rest from servile labor. So how are contemporary Catholics doing with respect to honoring the Third Commandment of God and the First Precept of the Church? According to the Gallup organization weekly Mass attendance among Catholics peaked in 1958 at 74%. That number had dipped slightly by the end of the Second Vatican Council with just over 65% of Catholics attending Mass weekly in 1965. 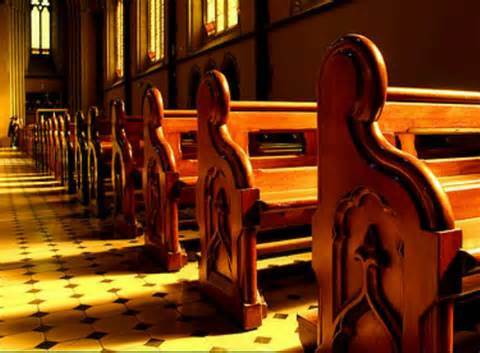 By 2003 Gallup was reporting only 40% attendance; in other words, 6 of 10 professing Catholics were NOT meeting their Sunday obligation to attend Mass. By 2012, a CARA Catholic Poll (CCP) was reporting that attendance had dropped all the way to 24%. Three of four Catholics consistently and willfully miss Sunday Mass, which is a mortal sin. What are the wages of sin? Just in case you belong to a parish that has an aversion to preaching sin and Hell (an unfortunate reality in recent decades), mortal sin deprives the soul of sanctifying grace and results in eternal damnation if not confessed and absolved prior to death. Fr. Francis Spirago unflinchingly addresses this in his excellent The Catechism Explained: Mortal sin is not possible unless God is no longer the final end towards which our intention is directed. Is there any better definition for someone who no longer feels a need to attend Mass on Sundays? Now we are back to the “heresy of the weekend” as I have termed it. This notion that Sunday is simply the second and final day of our weekend, and in all truth, belongs to us for our leisure and entertainment. This ties directly back to the damning statistic that 76% of Catholics do not meet their Sunday obligation (the complete opposite of the faithful’s participation in 1958). The invention of the weekend directly flies in the face of the sanctification of Sunday. To give Sunday back to God is something that many families will find challenging. As stated at the beginning of this post, it will make you counter-cultural, even among fellow Catholics. Often families find themselves pulling apart from each other instead of collectively resting in the Lord. Shopping, sports and even non-essential work lead family members to divert their day away from our Lord and indeed, from each other. There are a few things we can strive for in order to further sanctify the Lord’s day. As much as possible attend Mass as an entire family. Share our Sunday meals together. Pray together, particularly the family rosary. Finally, resist “projects” that are better suited for Saturday due to their physicality and time commitment. Posted on July 14, 2013, in holiness, life and tagged Catholic, Dies Domini, First Precept of the Church, Pursuit of Holiness, Sunday, Sunday obligation, Third Commandment. Bookmark the permalink. 1 Comment.